Though this moon cycle is darker as we get closer to the Winter, it is also a grateful moon as we grow closer to our loved ones and keep the warm glow within. This is an enchanting giveaway this moon cycle! A spot in Drucilla's Faerie Ring starting Winter Solstice! Do you believe in faeries, deep in your heart of hearts? I do. In my upcoming e-course, the Faerie Ring, we will learn skills that will help us connect with the Fae. During this twelve-week Winter Session, we will be developing our intuitive abilities, observing and attuning to the world of Nature, and celebrating the Celtic wheel of the year. Our activities will be intimately tied to the season as we learn about Faeries and journey into their Realm. The first group will begin on December 21, the Winter Solstice. Come into the Faerie Ring for a magical journey! with the first course beginning on the next New Moon! This is a new offering of mine revolving around the seasons of the moon. Each seasonal package contains 2 e-courses, a seasonal Lunar Flow and an e-course that embodies the season. 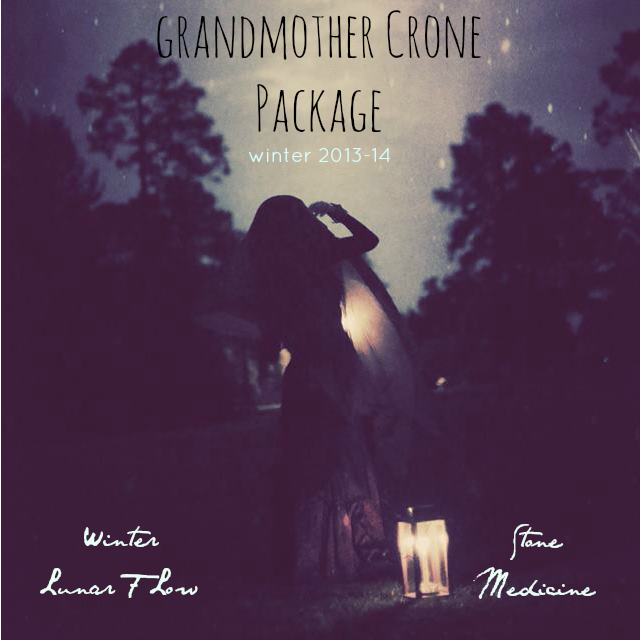 Grandmother Crone contains Winter Lunar Flow and Stone Medicine: 6 weeks of Crystal healing! Winter Lunar Flow will focus on creating healing layers for our Winter skin. And the first Stone Medicine will focus on gathering the bones of Mother Earth and creating a healing kit of stones specifically for you at this time on your life. I hope you will join us! Enter the widget below! Two lovely Faes will be chosen randomly in one week's time!